The DrumRight Plug-N-Lok are specially designed to make drum security simple and cost effective. Protect expensive drum contents by removing the 2" and 3/4" plugs and installing Plug-N-Lok plugs. An expandable heavy-duty rubber gasket expands as the high torque wing nut is turned clockwise to form a liquid and airtight seal. Once the plug is securely tightened, a padlock must be installed to lock the wing nut in place. Plug-N-Lok is designed for use with a No. 1 or No. 3 Master Lock® (not included). It can also be used as an easy access bung. 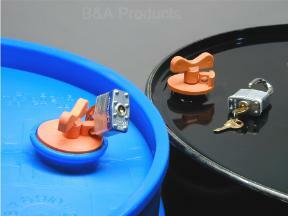 The Plug-N-Lok security plugs are not to be used for shipping filled drums.